Spark 08 will be from Saturday 9th – Sunday 17th August 2008 in Ballymena. Forms and more details will be coming in the new year. Keep checking back for details but in the meantime get those dates in your head and your diary (if you have one!!) and we’ll see ya there!! Here’s a date for you all to stick in your diaries and share with your friends! 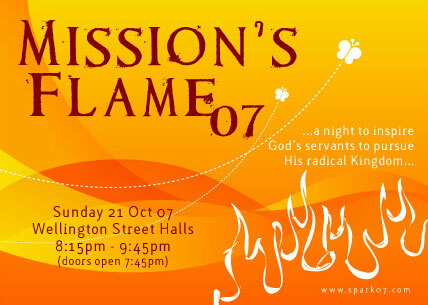 We are hosting an event called “Mission’s Flame” on Sunday night 21st October at a venue to be confirmed. Acting as a Spark 07 reunion, while also being open for young people right across the area, this will be designed as a night to continue fuelling all Servants Pursuing A Radical Kingdom, with perhaps a bit more information on what’s to come in the future. We also hope to have a surprise gift ready on that night!